Connect your Lightspeed-webshop with Trustpilot. Also available for companies using the Trustpilot Free subscription. Automatically invite your customers for service and product reviews. 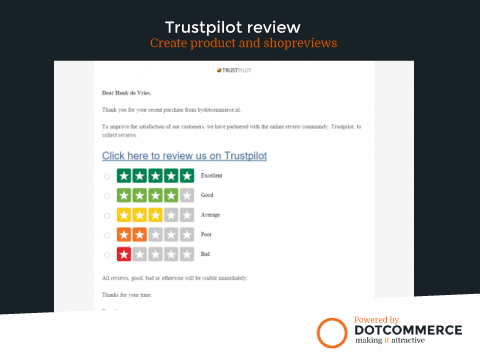 Create customer confidence with Trustpilot. Increase conversions with the power of your customers. Built on honesty and transparency. Trustpilot is the peoples' choice for reviews. With over 200,000 businesses reviews and 1.1 trillion ratings and reviews displayed in Google annually, companies use Trustpilot to establish credibility and improve their reputation. How does TrustPilot Connector work? With the Trustpilot Connector app you are able to invite your customers to rate your company or the products that they bought. Invest in trust, collect valuable reviews, increase your conversions, and climb to the top of search. 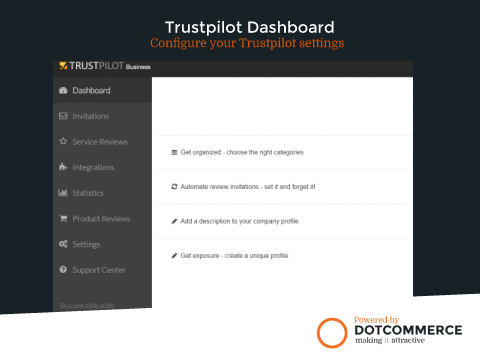 Step 2: Connect the App to your own Trustpilot account. Step 3: Determine the moment the review invitation is sent. 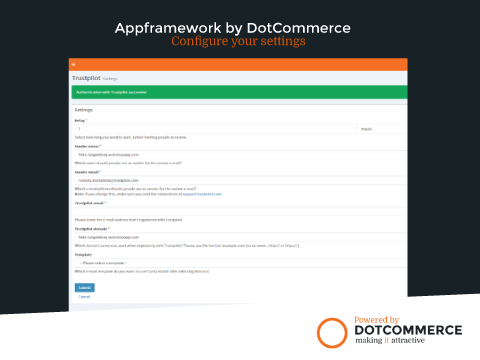 Step 4: Configure your sender and product review settings. Step 5: Save your configuration. TrustPilot Connector takes care of the rest. With this App you connect your Lightspeed webshop to your TrustPilot account. You need to have a valid TrustPilot account. The App is supported by almost every theme. If your theme does not support the reviews, please contact us.